injury to tissues due to exposure to cold. Usually the first areas of the body to freeze are the nose, ears, fingers, and toes. The flesh feels cold to the touch, and frozen parts become pale and feel numb. There may also be some prickly or itchy sensation. A person suffering from frostbite may feel no warning pain. In mild cases, proper treatment can rather quickly restore normal circulation of blood. In more serious cases the area may become painfully inflamed, and blistering may follow. Especially severe frostbite can cause death of the injured tissues and gangrene. Mild frostbite usually appears as a shallow, blanched wheal on the nose, ears, fingers, or toes. After rewarming, the area is slightly reddened for several hours and then resumes a normal appearance. If the frostbite is more severe, deeper tissues are affected and the area appears waxy and feels doughlike to the touch. With rewarming, the area becomes edematous and the patient feels itching, burning, and deep pain. Later on, mild edema may remain and the skin becomes mottled, cyanotic, or red without blistering. Over the following weeks the pain and edema should subside, but the skin may peel and the patient may experience increased sensitivity to cold in that area until healing is complete. Blistering occurs in deeper frostbite. The vesicles may contain pink or clear fluid that has leaked from damaged cells and tissues. Eventually the vesicles contract and dry out, leaving an eschar that sloughs off and exposes new skin underneath if there has been adequate circulation to the part. Severe frostbite damages all layers of soft tissue down to connective tissue and bone. The frostbitten area is hard and wooden and appears lifeless. There is no sensation of pain and the patient cannot voluntarily move the frozen part. With rewarming there are aching pain, burning, and blistering. If there is no pain or other sensation after rewarming, the tissue may be dead and amputation may be indicated. Treatment. Rewarming is best done in an emergency care facility where assessment of the extent of frostbite can be done and appropriate measures taken to rewarm the frostbitten part without further damaging tissue. In the field, it is best to keep the part as warm as possible to prevent further freezing. Blankets and warm clothing are appropriate and, if possible, the frozen area can be placed in contact with any other part of the body that is warm. Rubbing and massaging the area is not recommended because it can only serve to further damage frozen tissue. The victim should not smoke and should avoid caffeine and alcohol because any of these can further restrict blood circulation. Emergency medical care, if the patient cannot be brought to the hospital and rewarming must be done in the field, includes rapid rewarming in water baths not exceeding 40.6°C (105°F). Hot water can cause further tissue destruction. Tetanus prophylaxis is administered as necessary. If severely frostbitten tissue swells to the point of totally restricting circulation, a fasciotomy may be required to allow adequate blood supply. Vesicles are left intact but frostbitten fingers and toes should be separated with cotton balls and a loose dressing applied. If the patient will be taken outside for transport to a medical facility, rewarming should be started at the hospital. Local tissue destruction resulting from exposure to extreme cold; in mild cases, it results in superficial, reversible freezing followed by erythema and slight pain (frostnip); in severe cases, it can be painless or paresthetic and result in blistering, persistent edema, and gangrene. Frostbite is currently treated by rapid rewarming. /frost·bite/ (frost´bīt″) injury to tissues due to exposure to cold. To injure or damage by freezing. a traumatic effect of extreme cold on skin and subcutaneous tissues that is first recognized by distinct pallor of exposed skin surfaces, particularly the nose, ears, fingers, and toes. Vasoconstriction and damage to blood vessels impair local circulation and cause anoxia, edema, vesiculation, and necrosis. Gentle warming is appropriate first-aid treatment; rubbing of the affected part is avoided. Later therapy is similar to treatment of thermal burns. Iatrogenic frostbite is the result of excessive use of ethyl chloride sprays for local anesthesia for the relief of muscle and tendon strains. Compare chilblain, immersion foot. observations Manifestations for superficial frostbite present as a white, waxy, soft, and numb appearance of the injured area while it is still cold. As thawing occurs, the area becomes flushed, edematous, and painful, and may become mottled and purple. Within 24 hours, large blisters form and remain for about 2 weeks before turning into a hardened eschar, which separates in about a month. As the eschar separates, it leaves painful, sensitive new skin that often sweats excessively. In deep frostbite, the injured part remains hard, cold, mottled, and blue-gray after thawing; edema forms in entire limb and may remain for months. Blisters may or may not form weeks after the injury. After several weeks, dead tissue blackens and sloughs off and a line demarcates dead from live tissue. Diagnosis is made by clinical evaluation plus a history of exposure to cold. 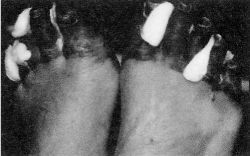 Loss of digits, ears, nose, and extremities is possible, as is secondary infection and long-term residual symptoms, such as neuropathic pain, sensory deficits, hyperhidrosis, hair and nail deformities, and arthritis. interventions Acute treatment centers around rapid rewarming by immersion in water (40° C to 42° C) for 15 to 30 minutes. Intravenous analgesics are used for pain. Immunological agents (tetanus) and antiinfective drugs are given for prophylaxis. Fluid and electrolytes are replaced. After the affected area has thawed, plasma expanders are used to reduce sludge and thrombus formation. Whirlpool hydrotherapy is used 20 to 30 minutes three to four times a day. Physical therapy is used to increase function after edema resolves. In deep and severe cases, escharotomy may be performed with debridement after retraction of viable tissue. Amputation is done for nonviable extremities. Sympathectomy may be performed for severe vasospasm. nursing considerations Immediately after injury, constrictive and wet clothing should be removed and the affected area should be insulated and immobilized. The area should never be massaged or rubbed or subjected to dry heat. Associated hypothermia must be stabilized with heated saline; warming blankets; and warmed, humidified oxygen. Long-term precautions should be taken with injured area to prevent dislodgement of eschar and further damage. An exercise program may be needed to prevent joint restriction. Counseling may be needed for altered body image from loss of digits or limbs. Education is needed about adequate protection when exposed to cold temperatures and use of preventive measures, such as carrying extra clothing, coats, blankets, fluids, high carbohydrate foods, cell phone, and hazard markers in the car when traveling in cold weather. Local tissue destruction resulting from exposure to extreme or prolonged cold. In mild cases, it results in superficial, reversible freezing followed by erythema and slight pain; in severe cases, it can be painless or paresthetic and result in blistering, persistent edema, and gangrene. Freezing of bodily tissues, especially the tips of the extremities. Expanding ice crystals damage the tissues and the local blood supply is cut off. The result is local tissue death (GANGRENE). n skin and subcutaneous tissue damage caused by prolonged exposure to extreme cold. Characterized by cessation of blood circulation, frostbite results in a number of signs and symptoms including edema, pain, vesiculation, anoxia, and necrosis. injury to tissues due to exposure to extreme cold. Not a common occurrence in free-living animals in the wild but is observed in poorly housed captive animals and birds. May cause whole-body freezing or gangrene of extremities including deer antlers. Deer forms are probably the most susceptible animals. 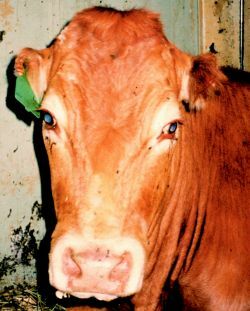 Gangrene of the extremities, especially in pigs, and of the comb in chickens does occur in the domestic species but only if they are in poor condition and are caught outside in a storm. Q. What are the visual distinctions between thermal burns and frostbite? Is it possible to definitively distinguish the two from each other in all cases, or do they present identically in many cases? In other words, are frostbite injuries-for all intents and purposes, actual burns and if they are not, in what ways do they differ? A. Early frostbite and minor burns may resemble one another visually (by whitened, blanched looking skin, and blister formation). However, last stage frostbite and thermal (heat) burns are very different. In late stage frostbite, the ice crystals in the cells melt and the ruptured cells pour out their contents, then blisters may form. Since the affected area has basically lost circulation, gangrene sets in rather quickly and the tissue turns black and dry. Deep (full thickness) heat related burns are surrounded by areas of erythema (reddened skin) and skin with less degrees of burning. Also, eschar is obviously charred skin tissue forming a scab like structure, and looks nothing like gangrene. The wound bed in a burn leaks plasma constantly. Blistering is pretty immediate with heat related burns of a sufficient degree.